My father taught me one important lesson — never take a job because you have to and, even if you need it, don’t act like you do. Maybe you heard it differently when I directly quoted my father. We sat in his car, I a teenager off from high school for the summer, he working as an “energy efficiency” expert in the role of extension agent for Virginia Tech. We looked out of the windshield at the small entrance to the factory Dad was visiting that day. This particular factory made ready-to-wear clothing just like other factories in the area — socks, jeans, that sort of thing. The owners weren’t bad people but some of them were less caring about the condition of their workers than others. I remember one factory where the owner complained that he wasn’t getting the level of performance out of the machinery that was promised by the manufacturer. A manufacturer rep had inspected the equipment and said nothing was wrong. The owner contacted the Va. Tech extension office and requested assistance. When Dad arrived, he interviewed the owner while I sat up front with the secretary for the factory. She was a pretty, young woman who had gone to business school and could type and take dictation as well as manage the petty cash and the file cabinet organisation. Because I was a good-looking, red-headed teenager, wherever we went Dad sat me down with the secretary to get the scuttlebutt and opinion of the owner/manager. Sometimes, he took me along for a tour of the factory, especially if he needed a go-fer to measure distances or equipment size. In this case, Dad made me stay with the secretary because the boss was a little agitated and wanted to personally unload on Dad about adult stuff. After Dad toured the plant with the owner and one of the shift supervisors, he collected me, along with a box of jeans that the secretary insisted on giving me as a present for being so kind and attentive. On the way back to the extension office in the basement of a wing in the Martha Washington Inn in Abingdon, Dad told me what the boss had said. Basically, the man wanted to increase factory output to at least 100 percent capacity in order to stay profitable and ahead of the cheap knockoffs that were starting to flood the market. If so, he could lower prices and remain competitive. If not, he would either have to let workers go or close the factory and he didn’t want to abandon the business because it had become his life’s work and he wasn’t ready to give it up. Dad returned to the factory without me and took temperature measurements around the equipment (mainly large cutting or sewing machines). The temperatures were only slightly elevated and did not account for a lower-than-expected output. He returned a second time, with me along to observe. He asked me to strike up a conversation with one of the workers and ask dumb, “innocent” teenager questions about what’s it like to work in the factory. Dad already knew what I reported back to him before I told him. It was not the equipment that was the bottleneck which slowed down production. They were operating in temperatures that were too high for humans to tolerate for eight to ten-hour shifts at a time, especially in the summer. Dad submitted his findings to the boss, who did not accept that the workers, whom he trusted as loyal and hard-working, were the cause of the problems, and requested that Dad redouble his efforts to find the root cause. Dad told me that this is the difference between management and labour. He rewrote his findings, suggesting that to lower the equipment temperature down to a more productive capacity, large industrial fans should be installed in both ends of the factory (basically a long metal building, thinly insulated against cold). The boss took Dad’s suggestion as a good sign that the manufacturer rep had missed something obvious, felt better for consulting Dad and installed the fans. The factory output increased significantly. The boss was happy and gave Dad a great recommendation. I recall that incident any time I hear a major figure in business such as Elon Musk wax poetic about the future or give away patents. We get so wrapped up in our jargonese that we sometimes forget the fact we are one species on an insignificant planet of a solar system in one of a few billion known star systems we call the Milky Way Galaxy. 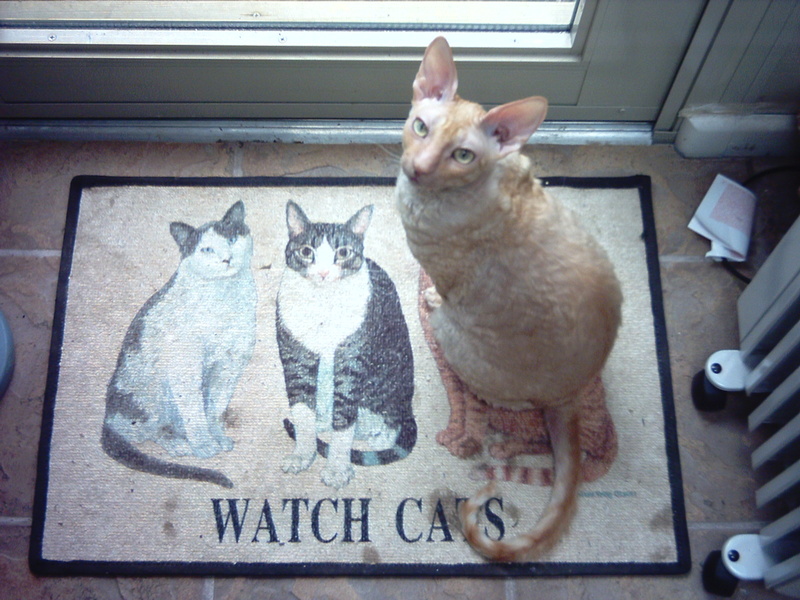 On the door mat labeled “WATCH CATS,” on the exact same spot where Merlin sat for a photograph, rests a telescope pointing down toward the ground, reminding me that my feet are usually stuck to terra firma rather than floating amongst the stars. Merlin spent most of his life in this house and I spent most of the last seven years in this house with him and his brother Erin, who sits nearby. Merlin taught me a lot in his sixteen years on this planet. I was never completely sure who was management and who was labour but I didn’t care — symbiotic love clouded the logic in such thoughts.